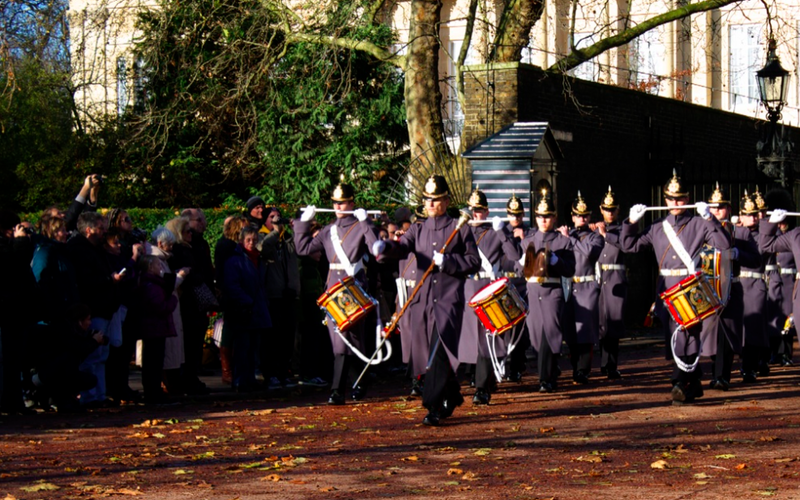 The Changing of the Guard at Buckingham Palace is one of the most popular attractions in London. The large crowds described in guidebooks initially turned us off to the experience, but with some time to kill before our flight home on Sunday morning, we decided to check it out. With no prior planning (we were actually reading tips while walking towards the palace), we managed to appreciate the experience and get some good photographs. We did find crowds when we arrived at 10:00 am on Sunday, however they were small enough to potentially allow us a second row view. However, we weren’t dedicated enough to wait against the fence for over an hour. Soon thereafter, we noticed commotion associated with a horse guard marching past the grounds. We later realized this was the horse guard changing at Whitehall, which happens 1 hour early on Sundays. 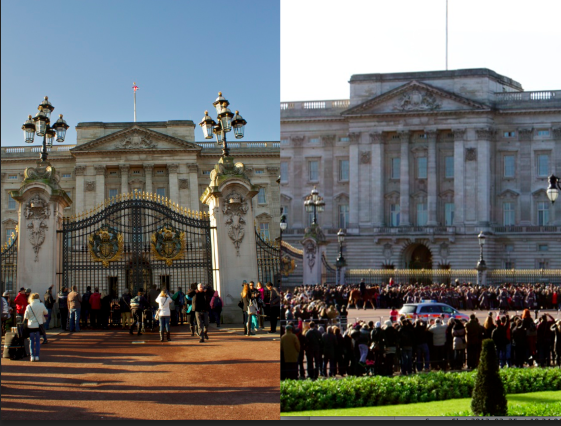 At 10am, the crowd at Buckingham Palace would have allowed us to get a second row seat (left), but right before the ceremony, we needed to get perched on a wall to get any viewpoint at all (right). With limited patience for waiting over an hour for the ceremony, we explored St. James’s Park, all the way to Horse Guard Parade. We snapped some excellent photos of the London skyline en route. With around 30 minutes to spare, we headed back towards Buckingham Palace. On the way, along The Mall, we noticed some activity at Stable Yard Road. To our delight, we ended up with last minute front row seats to the Old Guard marching out from Friary Court towards the ceremony. After the entire troupe marched by, we scrambled to the Victoria Memorial and climbed atop one of the walls. We were not able to see any of the traditional procedures carried out directly in front of the palace, but still saw several marching troupes and enjoyed the band music. Old Guard marching from Friary Court on Stable Yard Road. We recommend this strategy for any other London visitors with limited time and an aversion to large crowds. We certainly got the feel of the tradition, but instead of waiting hours crowded against the Buckingham Palace fence, we explored the scenic St. James’ Park. This entry was posted in Things To Do, Tips & Tricks, Travel and tagged England, Europe, experience, London, London 2012 Trip, UK by Ryan. Bookmark the permalink.